Hillary Clinton Wins! Barack Obama Loses , Pollsters Lose! Contrary to ALL of the polls and political pundits, Hilary Clinton Beat Barack Obama into second place by a healthy distance of 4%+ in the New Hampshire Democratic Primary. Hours before the poll, Hilary Clinton had literally shed a tear in the face of impeding defeat, which is now being used by political pundits as the moment that the polls turned in her favour. However at the time no one indicated that the sign of weakness could be construed as positive for the Clinton campaign. How could the pollsters get it so wrong ? Prior to the voting, pollsters were not only calling for an Barack Obama victory, but calling for a poll lead of as much as 14% which suggested a landslide knock out punch to the Clinton campaign. Commentators are quickly drawing parallels with Bill Clinton's 1992 campaign when he turned around early defeats to win the Democrat nomination. Whilst conspiracy theories are rife as to why there is such a big difference between the results and the polls, such as related to the potential hacking of the Diebold optical scan counting systems which were highlighted in a documentary http://hackingdemocracy.com/. The results can be put down more to inaccurate polling than election fraud. Therefore the result is a warning to pollster's going forward not to under estimate the favorite despite inaccurate poll readings, as Hilary Clinton is now destined to win the Democratic nomination after the wobble in Iowa. 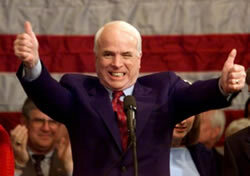 Inline with expectations, John McCain won the republican New Hampshire primary, beating the Iowa front runner Mike Huckabee into second place and similarly now seems destined to achieve the republican nomination for the November 2008 US Presidential election. McCain's main rival is the former governor of Massachusetts, Mitt Romney, who has so far failed to achieve a result in the two primaries to date. The Iowa winner Mike Huckabee is seen as a flash in the pan with little chance of actually winning the Republican nomination.